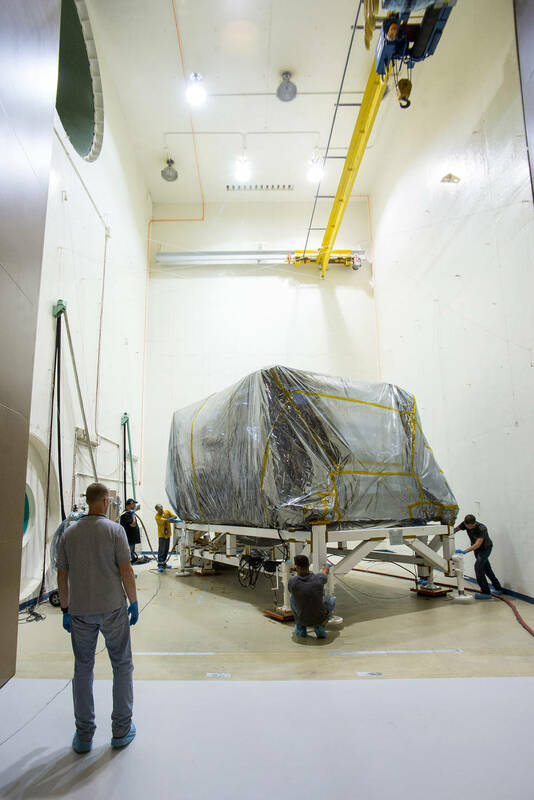 September 4, 2015 – A critical part of NASA’s James Webb Space Telescope successfully completed acoustic testing last month. The Integrated Science Instrument Module, or ISIM, passed all of the “severe sound” tests that engineers put it through. The Integrated Science Instrument Module (ISIM) is one of three major elements that comprise the Webb Observatory flight system. The others are the Optical Telescope Element (OTE) and the Spacecraft Element (Spacecraft Bus and Sunshield). The ISIM was subjected to the acoustic test at NASA’s Goddard Space Flight Center in Greenbelt, Maryland. Engineers used the Acoustic Test Chamber, a 42-foot-tall chamber, with 6-foot-diameter speaker horns to replicate the launch environment. The horns use an altering flow of gaseous nitrogen to produce a sound level as high as 150 decibels for two-minute tests. That’s about the level of sound heard standing next to a jet engine during takeoff. The ISIM was tested at five different sound levels to demonstrate it could survive the noise and vibrations it will experience when the Webb telescope is launched in 2018 aboard an Ariane 5 rocket. The sound experienced during launch comes primarily from the solid rocket motors of the launch vehicle. During the acoustics test, the speakers can still be heard outside of its insulated massive metal doors. 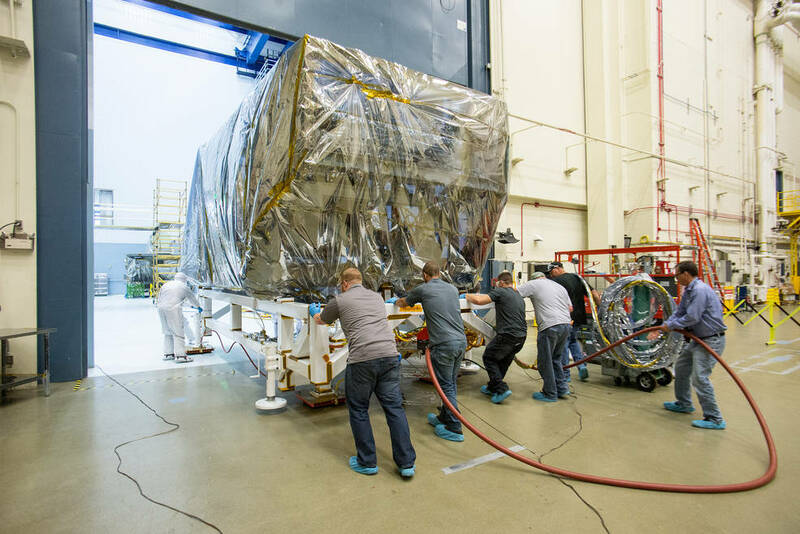 Following the acoustics test, the ISIM was pushed back into the Spacecraft Systems Development and Integration Facility (SSDIF) clean room so it could be un-bagged, and inspected. 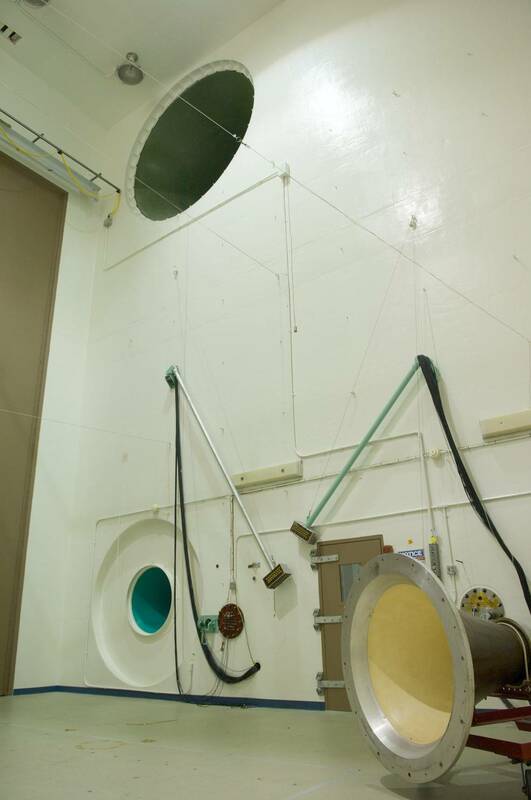 Once engineers made sure the ISIM passed the acoustics test, it was re-bagged and moved to the Electromagnetic Interference or EMI facility for electromagnetic interference testing. The ISIM is just one of the many Webb telescope components that continue to be tested as the observatory begins to come together this year. The James Webb Space Telescope is the scientific successor to NASA’s Hubble Space Telescope. It will be the most powerful space telescope ever built, able to detect the light from the first galaxies ever formed. It will study every phase of our universe’s history, ranging from the first luminous glows after the Big Bang, to the formation of stellar systems capable of supporting life on planets like Earth, to the evolution of our own Solar System.